This is one of those insanely cool idea blogs that gets filed squarely under the ‘Why didn’t I think of that category’. 16 extremely talented “Twarts” render the same pop culture character each week, then post their finished piece up for the world to see at the comictwart blog. 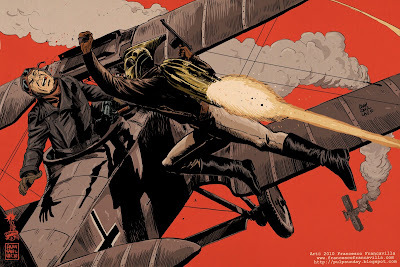 This week it’s The Rocketeer, from the brilliant mind of the late Dave Stevens. Always a sucker for any guy with a jet-pack, I find myself drooling a little bit more each day, as each new peice is posted. To get in on the fun and see more of the exclusive art on show, like this number from Francesco Francavilla, click the jump.